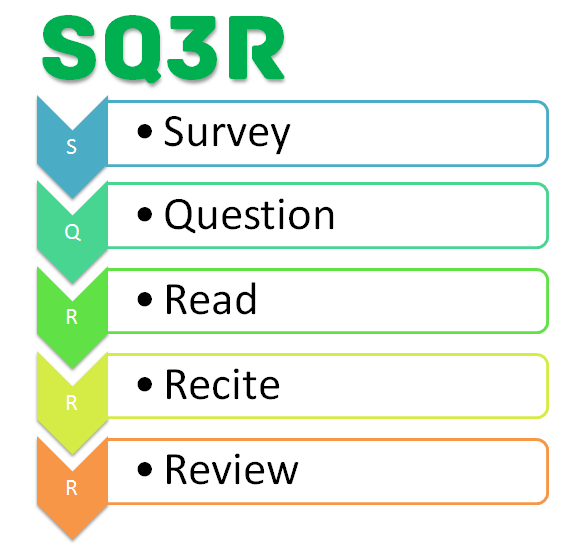 The SQ3R method is the reading and studying system preferred by many educators. Reading research indicates that it is an extremely effective method for both comprehension and memory retention. It’s effective because it is a system of active reader involvement. Step 1. “S“= Survey| Before you actually read a chapter, or go over a particular section of notes, take five minutes to survey the material. Briefly check headings and subheadings in order to understand the author’s organizational pattern of ideas to be discussed. Scan all visual material. Read introductory and summary paragraphs. This preview will enable you to anticipate what the chapter is about. Step 2. “Q“= Question| Create interest in the material by asking: What are the main points of the chapter? As you read, keep the question in mind and figure out the most important points. It gives you a clearly defined purpose for reading, and helps you maintain interest in the material. Step 3. “R“= Read| Read the chapter actively for meaning. Go through the paragraph before underlining, then underline key words and phrases to help you recall the main points. Be selective, you don’t want to highlight non-important points or miss anything that can help your comprehension. Summarize main concepts in your own words in the margins. The more active you are in the reading process, the more you will retain. Step 4. “R“= Recite| After every few pages, close your book and recite aloud the main points to the questions you posed in step 2. Try to recall basic details as to the author’s intent by putting them in your own words. Verify your answer by checking the text. If you can’t remember the text, read through it again. If you don’t get it now, you won’t remember it for a test. Take as much time as you need to answer your questions. Don’t be frustrated, this takes more time but the information will be clearer in your mind. Step 5. “R“= Review| Finally, review the chapter every so often to fix the material in your mind. Keep rereading your margin notes and underlinings. Verbalize the sequence of main ideas and supporting facts to aid retention. Numerous reviews are a lot more effective than one cramming session the night before an exam. Review once right after you’ve finished reading and then every couple of days. The SQ3R is time consuming at first, expect it to take ten to fifteen percent longer to read a given chapter when you first begin. Research indicates a 70%% increase in retention after two months of using the system and, eventually, a reduction in time spent preparing for exams. This entry was posted in Uncategorized and tagged books, literature, research. Bookmark the permalink.